For Halloween 2007, I created a Lego skull to display at the Palisades Center Lego Store Community Window that we of the New York Brick Artists (aka Sick Brick) control and display our creations in. 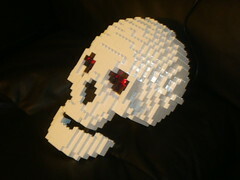 The skull is built completely with Lego, the LEDs behind trans black bricks and controlled by an Arduino stamp kit so the eyes glow in and out. I finally put it online on Flickr, YouTube and Facebook to share with the world (and maybe enter a contest or two online).